A safe and robust system for a business does not come together by accident. Electrical work is both an art and a science. The artistry creates neat and efficiently routed wiring that does not get in the way of day to day operations. The science creates a correctly balanced system that delivers your needs now and for the future. The benefit of this is that you will avoid the hassle of realising that an extra socket or one more lighting unit is needed when the work is finished. In other words, you need South London Electricians. We deliver what you actually need, not what we think you need. Trading for over a quarter of a century, we have a wide experience of all commercial electrics from three-phase heavy machinery such as car lifts, metal presses and backup generator systems to 12 volt safety lighting and data cable installation. We have worked in almost every industry sector. We have installed commercial kitchens in restaurants and schools, repaired faulty and dangerous three-phase supplies to hotels, wired new retail and industrial units, installed flameproof MoT bay electrics and other garage equipment, renovated systems in nursing homes and installed state-of-the-art CCTV security systems for businesses in south London, including Streatham, Balham and Herne Hill. Give us a call on 0208 406 9834 without any commitment whatsoever. You will speak directly to an electrician, not a receptionist. You can discuss your detailed requirements right from the start and arrange a site visit, all with a single call and no waiting for a call back or the worry that a secretary has forgotten to pass on your details to the electrician. We can give an on-the-spot price at the end of the site visit, followed up with a detailed quote so that you will not be subjected to any nasty surprises. Commercial electrical systems are governed by a different set of regulations to domestic installations so you need a specialist electrician. Someone who knows the regulations. Our commercial electricians know the rules inside-out, so all of our work fully conforms to current safety and performance standards and legislation. On completion of the work, we will issue you with a certificate, so you have the peace of mind that your system will be legal, safe and fully guaranteed. We are members of several key regulatory bodies – NICEIC, checkatrde, Trustmark etc and we get a lot of work by word of mouth. Many of our commercial clients use our electrical services time and time again. One of our most popular repeat commercial services is the inspection and maintenance of emergency lighting systems. By law, these must be inspected, tested and maintained twice a year. 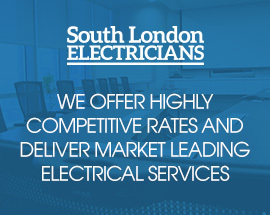 And if you need a local emergency commercial electrician, we are available 24 hours a day, 7 days a week – 0208 406 9834.